Its a sickness! 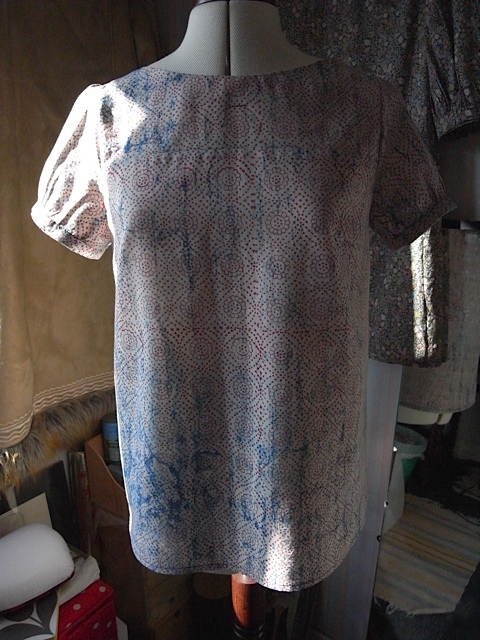 I’ve made another blouse. 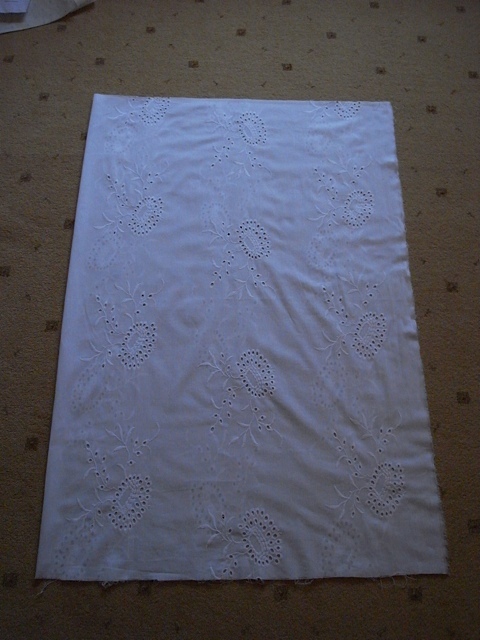 I bought 3 more metres of this gorgeous fabric from M&M, in the hope that I would be able to get 2 blouses out of it. 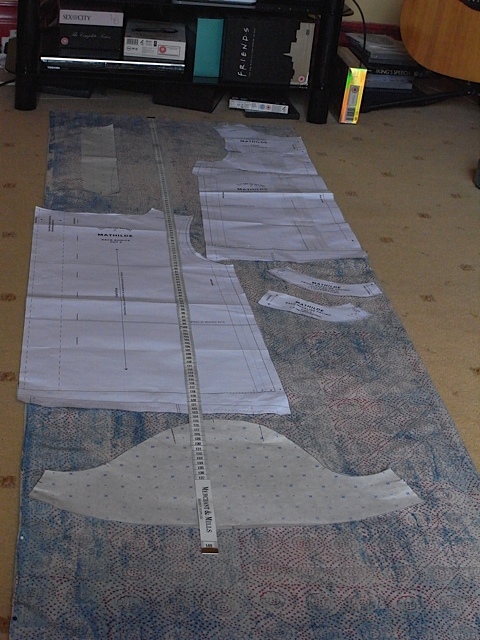 As the fabric is just a mere 110cm wide it takes a bit of juggling. As you can see the back piece of the bodice is overhanging the fabric a bit, this doesn’t matter as I don’t have the button fastening down the back so usually end up cutting off several inches down the centre back seam anyway. 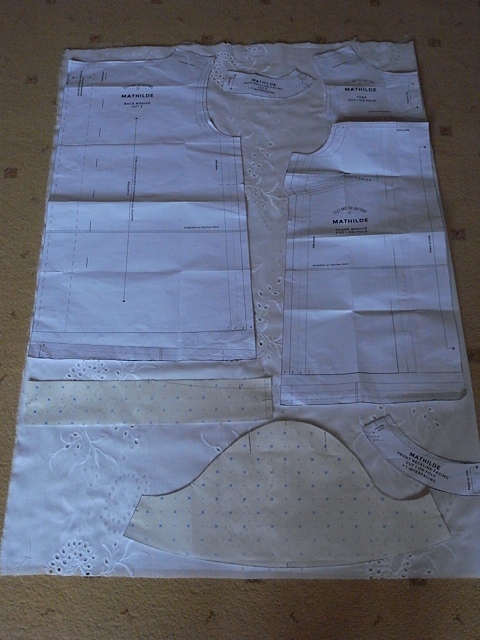 I thought I might have to put the sleeve piece on sideways in order to fit it all in but happily using the shortest sleeve pattern piece I was able to get it on right way round. The picture shows the cuff piece (top left hand corner) in the sideways position but I actually managed to get that on right way round too. 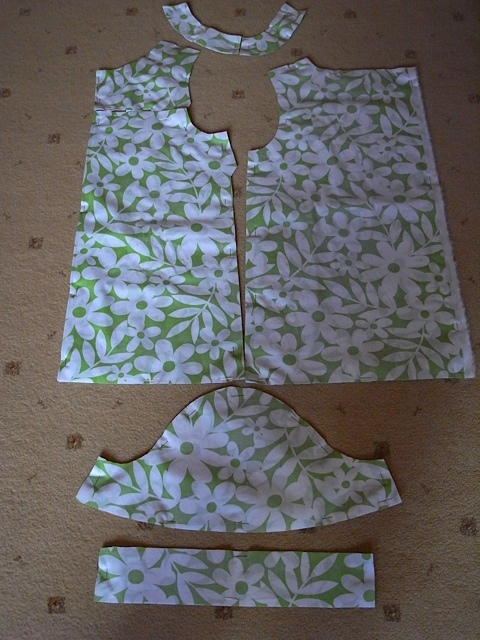 It is a bit of a tight squeeze with the bodice pieces but they do all fit onto just under 150cm. 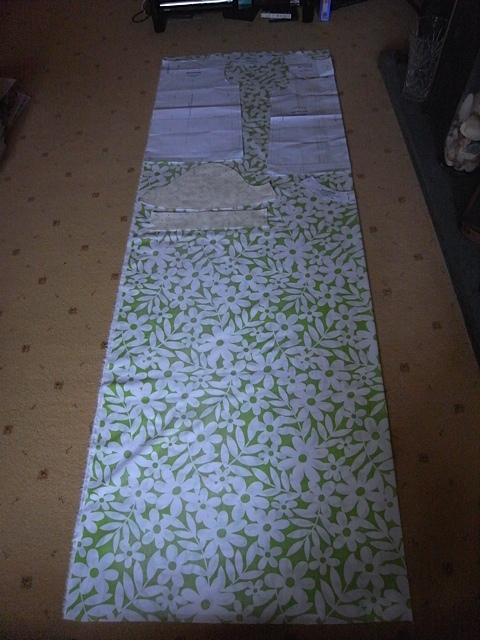 How to get two tops out of 3 metres of narrow fabric! Now, I don’t have an overlocker but I am so far getting away with just zigzagging the edges. 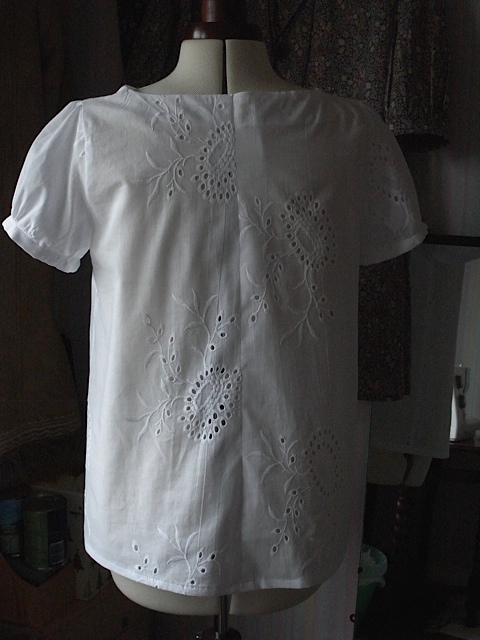 I have also gotten better at this each time I make a blouse. Getting pretty neat now. centre back seam. Looks better in real life than it does here! 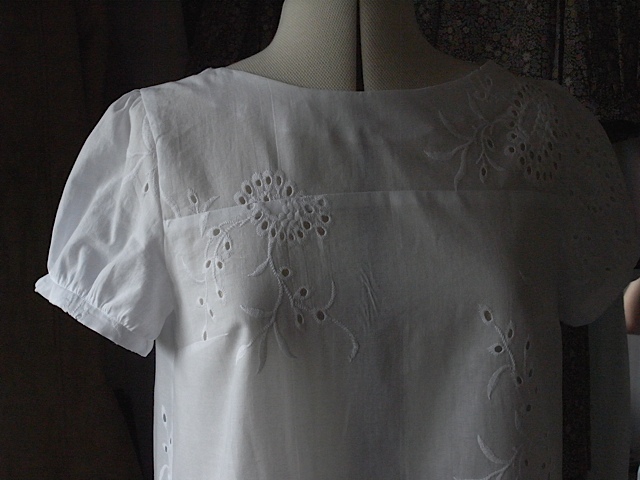 I really like the inside of my blouses, the finish is quite lovely. Even if I do say so myself. It is very similar to this one except the sleeves are shorter now. 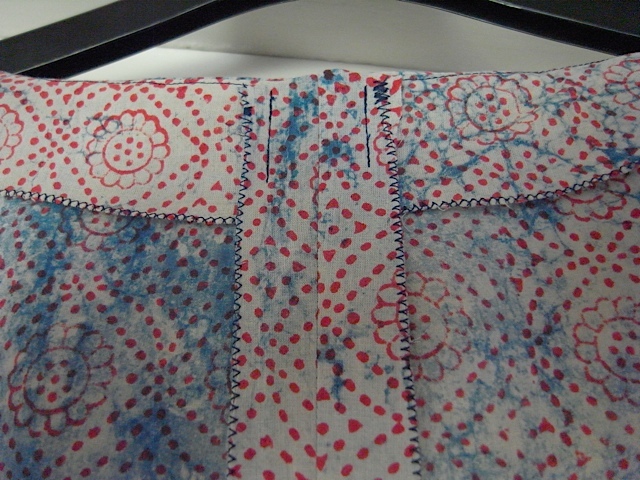 The sleeve cuffs gave me a bit of trouble on this one, but only on one sleeve. 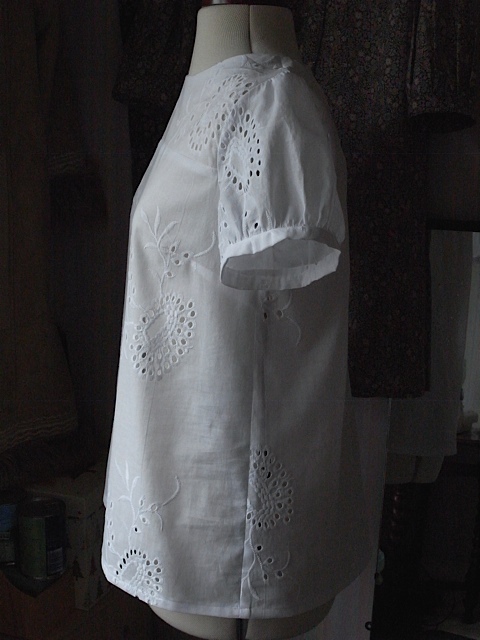 I just couldn’t get it to attach nicely, in the end I did what Anne from the first Great British Sewing Bee used to do with tricky fabrics and situations, and I talked very firmly to it, and it eventually went on OK. Not perfect but OK. 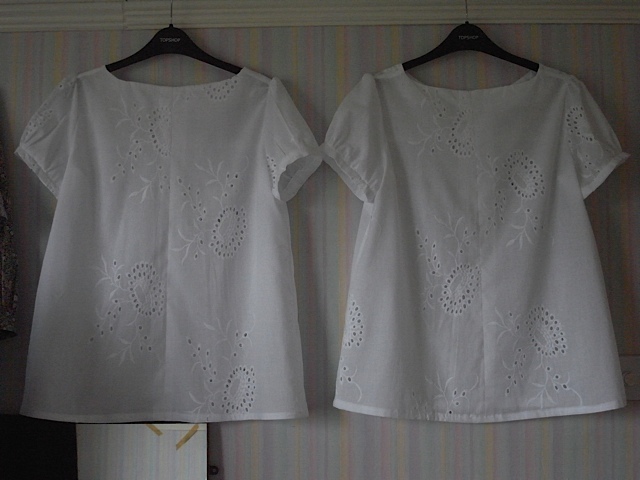 I have more fabric for more blouses, probably another four I think (and I’m thinking about buying some more of the white cotton eyelet), but I might need a bit of a break from making these for a little while. Lets see what I come up with next. I have to confess something, something I’ve sort of been in denial about. 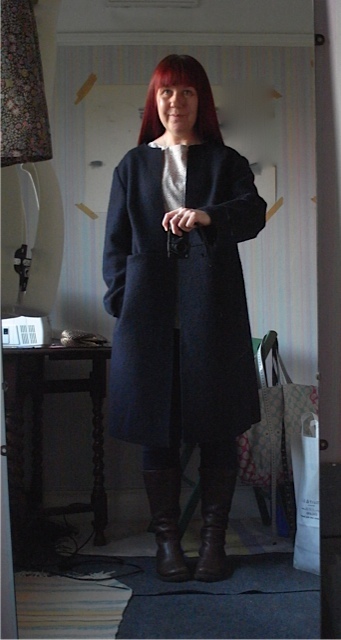 I made a bit of a sewing mistake when I made my coat, yes I did. 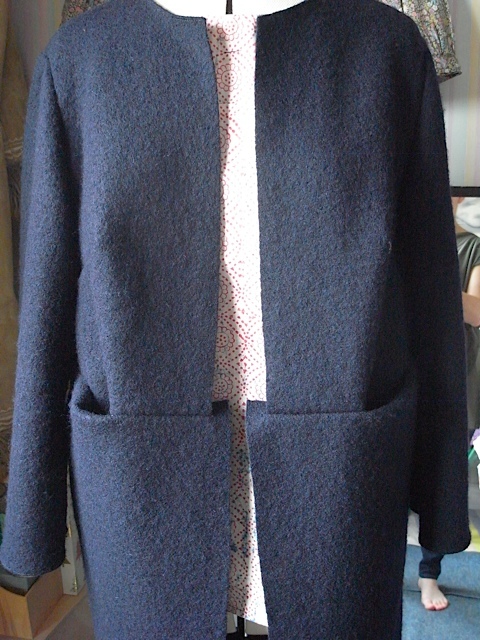 I touched upon it in the post about the making of the coat but I sort of brushed over it. its the 2cm I cut off the bodice. That was really and truly a mistake, although I did it intentionally, I now know I really really shouldn’t have. 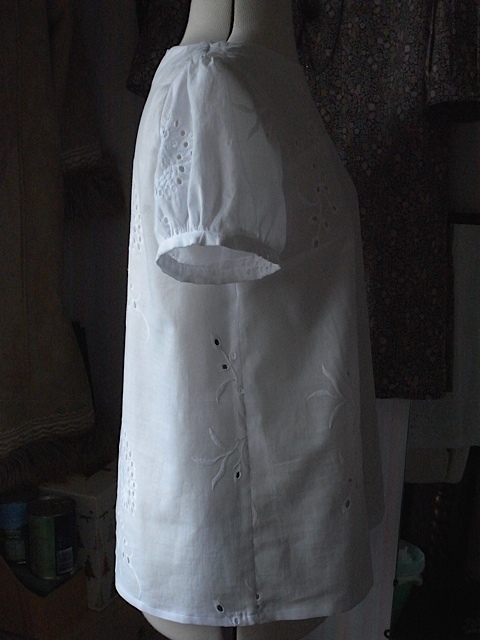 I thought it was the right thing to do, right up until I was attaching the bodice to the skirt piece. Thats when I realised that the bottom half was wider than the top. Now, I can live with it, and I even quite like it. So what is the problem you might ask? Well I’m admitting to myself that its not supposed to be like that and that I MADE A MISTAKE! I don’t think I will ever wear it to visit Merchant & Mills, or to a “Strand” coat convention as they might laugh at me for making such a mistake, but elsewhere I think I can get away with it. I feel it lends a certain design element to the coat and I’m certainly never going to see anyone else wearing the same coat. I wore it out Saturday evening and nobody laughed at me (that I could see) so I think I’ve gotten away with it. Yes it might be better if I hadn’t cut off the 2cm, it would mean that the edges of the front bodice would meet in the middle but thats all. I’m still debating about whether to cut off 2cm of the skirt part, I probably won’t but its always an option. It just looks so right with hands in pockets. and I was very happy to get some thread to match. 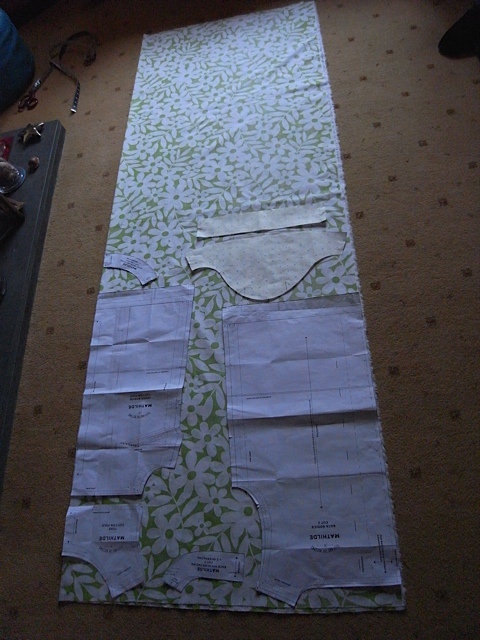 Pattern pieces laid out on the fabric. again I will get 2 tops out of this. Another view. Can see the pattern pieces better. Looks a bit like an hawaiian shirt at the moment! I wouldn’t normally wear such a bright shade of green, but it’s diluted quite a bit by all the white flowers, so it doesn’t appear quite so vibrant. I’m not too sure about the cotton Poplin yet. 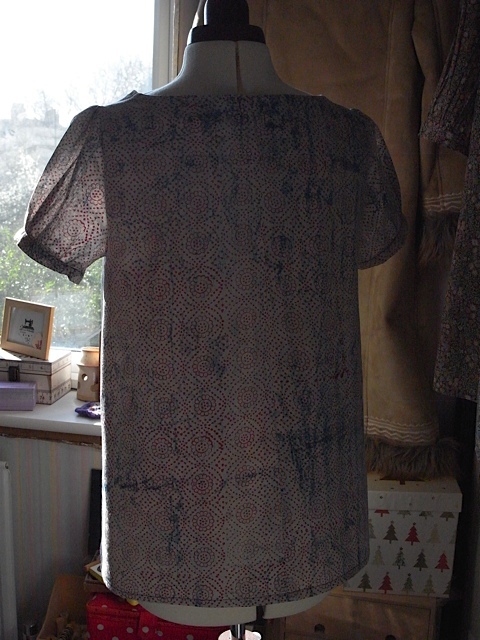 Its quite a crisp fabric and at the moment feels a bit stiff, I’m hoping it will soften with washing and wearing. Otherwise its a gorgeous fabric and pretty good value for money, I’ve got two lovely tops for the price of £28, which lets be honest, you can’t really get a decent top on the high street now a days for that. I’m also very pleased that this blouse only took me 6.5 hours to make. That does not include the cutting out of the fabric. 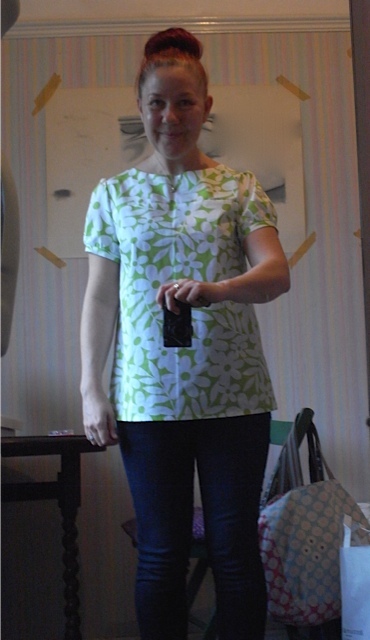 I’m really happy as the first blouse I made back in January took me about 12.5 hours (not including the cutting) so i’ve come down to just under half the time. 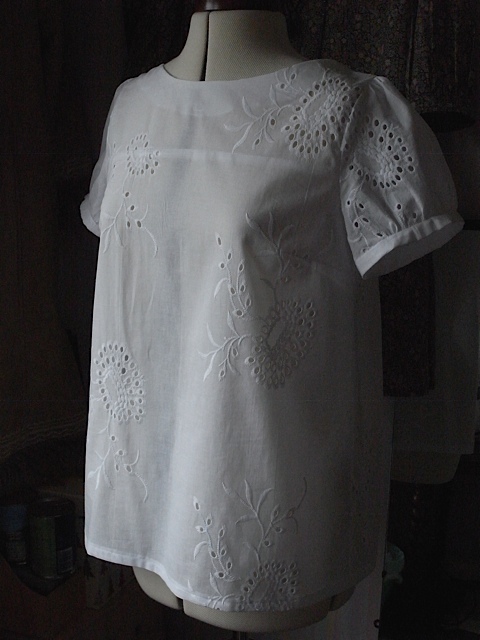 And although I am happy to take it a little slower now a days, I am also happy to know that I can make one of these blouses in a day. 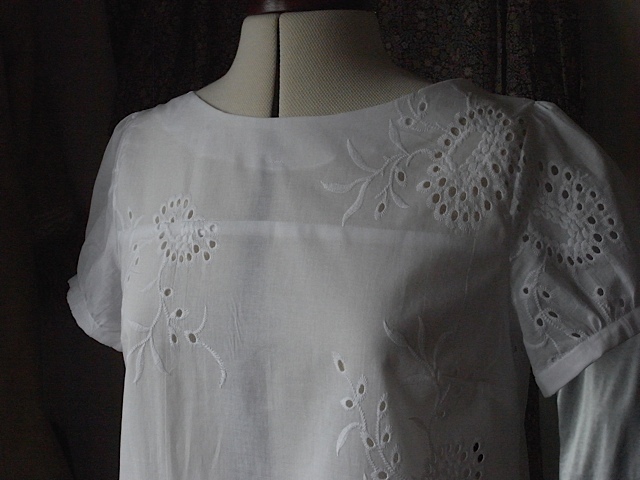 I now have two of these white blouses. And I love them. The backs. So very similar, but ever so slightly different. I really love how it looks with jeans. 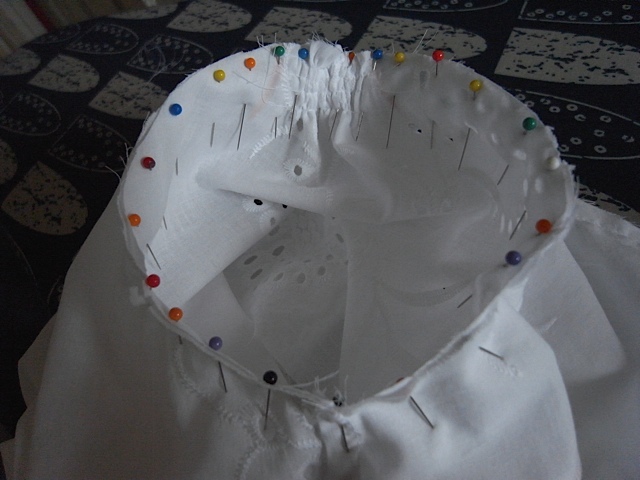 I would like to share this picture of the pins in the sleeve head, I just love how the coloured pins look against the white. Thats all. Just want to share the changes I’ve made to the Mathilde pattern. 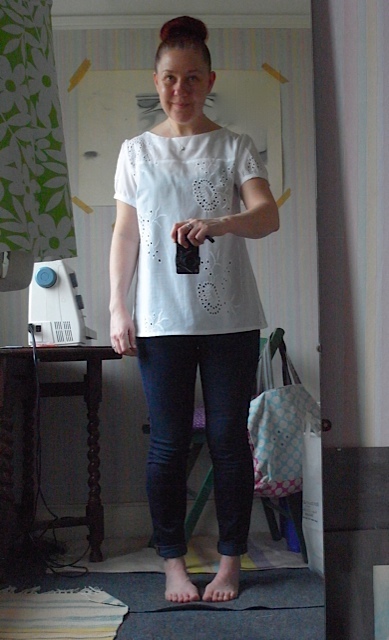 It no longer really resembles the Mathilde top as Tilly intended it. 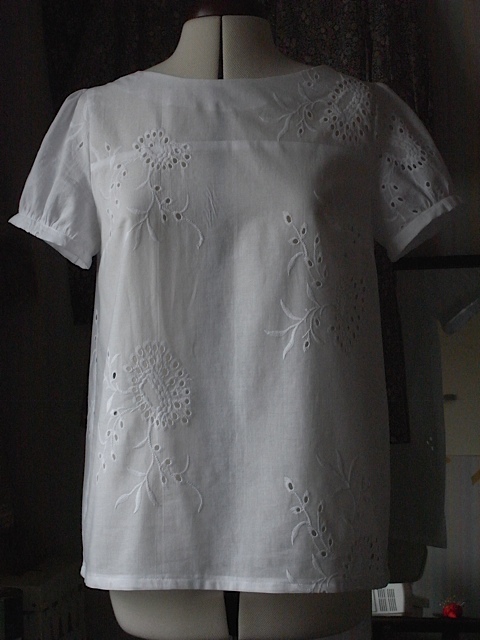 I’ve turned it into a dress and a top that suits me and my sewing style, both of which are simple! 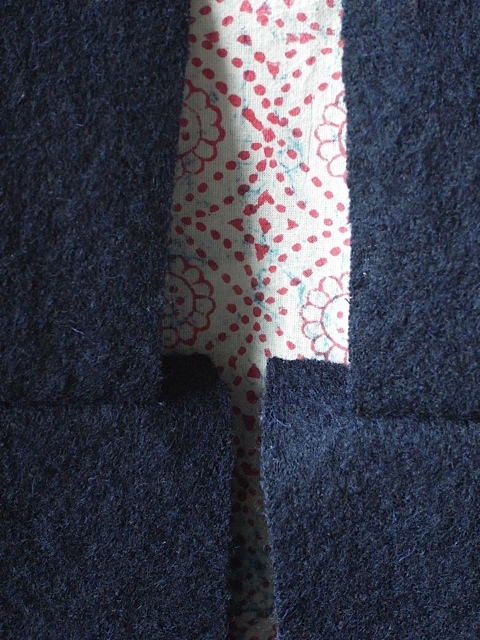 close up of the shortest sleeve. all I did with the sleeves was trace around the original and then move the original up the sleeve to the desired length and then trace along the bottom of it to keep the curve. Works really well. 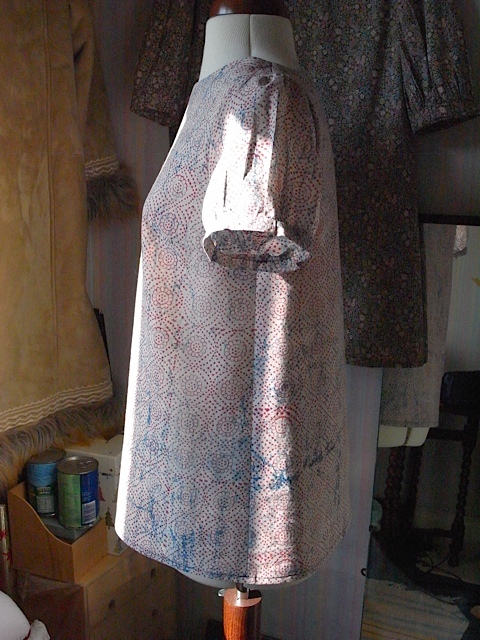 And with the dress pieces, again traced around the original pieces and then carefully added the extra length remembering to keep the curve at the bottom of the pieces. 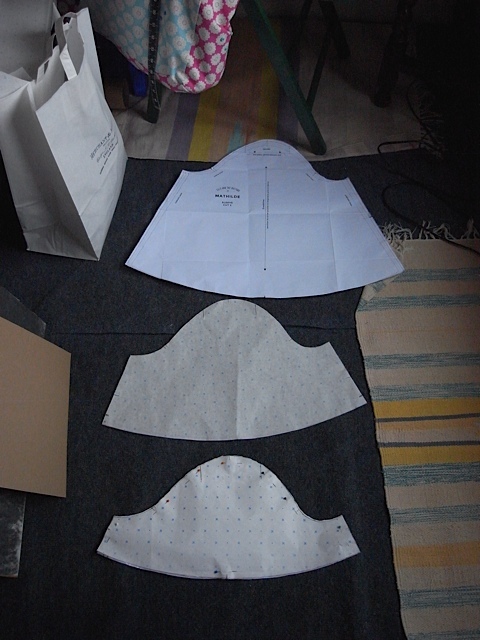 as there is a slight curve to the original bodice pieces. Hope that makes sense. 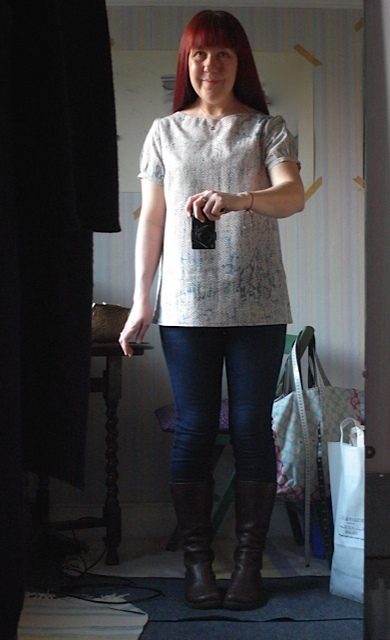 For years now I’ve been on the look out for the perfect white cotton blouse to go with jeans. I’ve bought various versions of OK ones but have never found the perfect one. 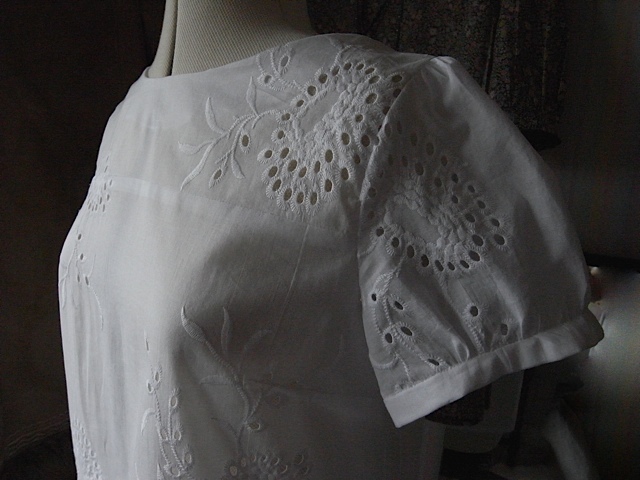 Whilst browsing “Fabric Godmother” I found this beautiful white eyelet cotton lawn fabric. Now I’m not always keen to buy fabric on-line as I usually prefer to be able to see it & touch it before I buy, but occasionally something pops up that just shouts “BUY ME” and this beautiful white fabric did just that. Initially I was thinking maybe a dress or perhaps another 3/4 length sleeve blouse and I wanted to buy 1.5 M of the fabric but it appeared I could only get whole meters. So I purchased 2M At £14 a meter. 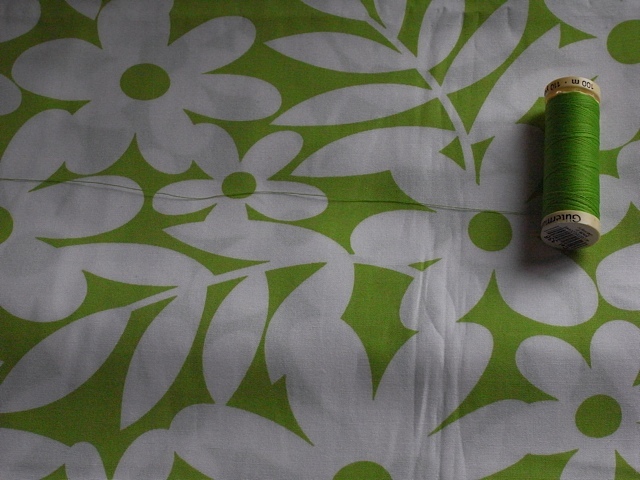 Along with 2M of this gorgeous fabric, but that will be another post. When the fabric arrived it was so beautiful I knew I wanted to make the most out of it. If I made a dress I would be using most of the fabric and it would be value for money, but I decided against a dress. A white dress is not the most practical thing for me. 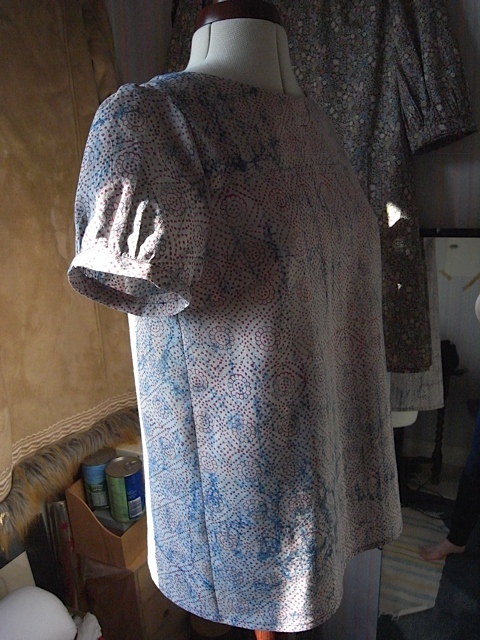 However a 3/4 length sleeve blouse would mean that I’d have a lot of fabric left over but not enough for another garment. 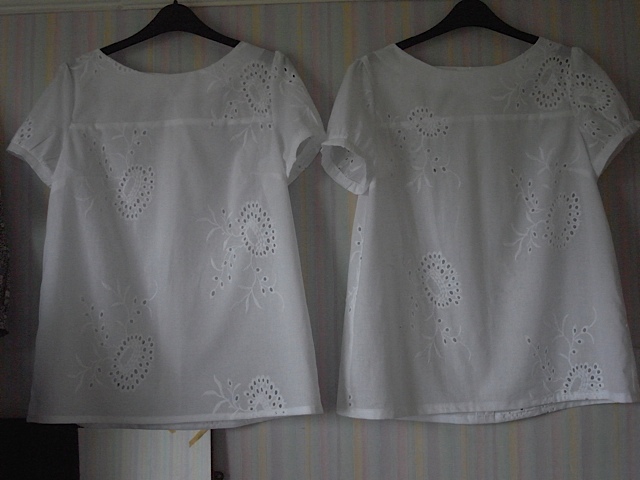 So I decided to re-draft the short sleeve pattern even shorter. This was an excellent idea as when I laid the pattern pieces out on the fabric I knew I’d be able to get 2 blouses from the fabric. It looked like the 2nd blouse might have un-cuffed sleeves though. That wouldn’t matter. I was just happy that I’d get 2 blouses from the fabric. Making it great value for money. I just love how beautifully this has made up. 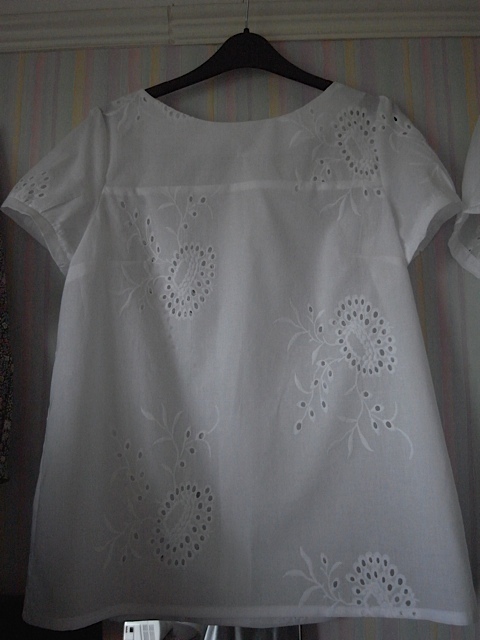 The eyelet pattern is quite big but looks quite effective I think. Gives the blouse a really professional look. I’m so so so happy with how its turned out, the little puff sleeves are so cute and pretty and look exactly as I wanted them too. I’ve compared this blouse to one I bought from Dorothy Perkins a couple of years ago for about £24 or something like that and it simply doesn’t compare. 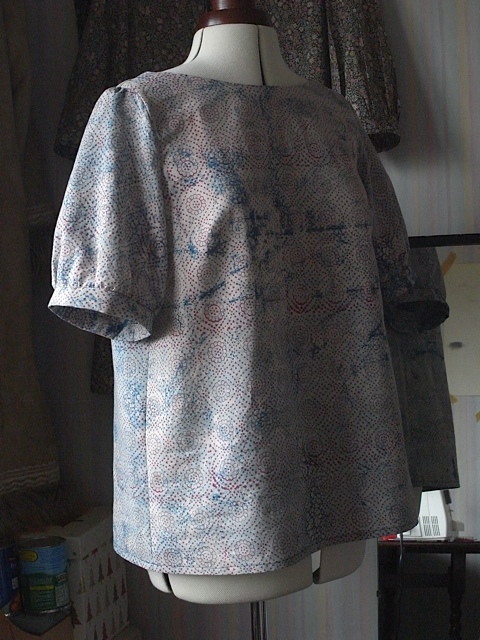 Don’t know if its the fabric or the pattern or the finishing but this blouse is for me PERFECT! I love the high neck line, the shape the sleeves everything. And I can;t wait for warmer weather to wear it. Looks fab with jeans, really does. 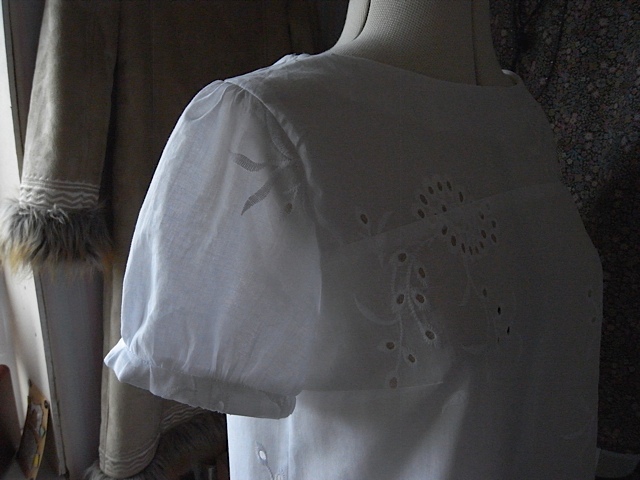 More lovely shoulder detail. Love that both shoulder sleeves are different. 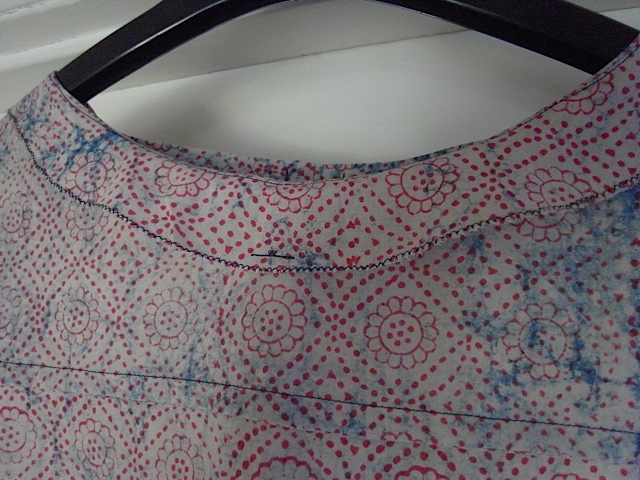 I also love that you can see the seams through the fabric, shows off the beautiful french seams I love so much. Shameless pic of me in PJ’s and messy hair, but its my blog and I don’t care! Like I say I really really really love this top and am going to make another. 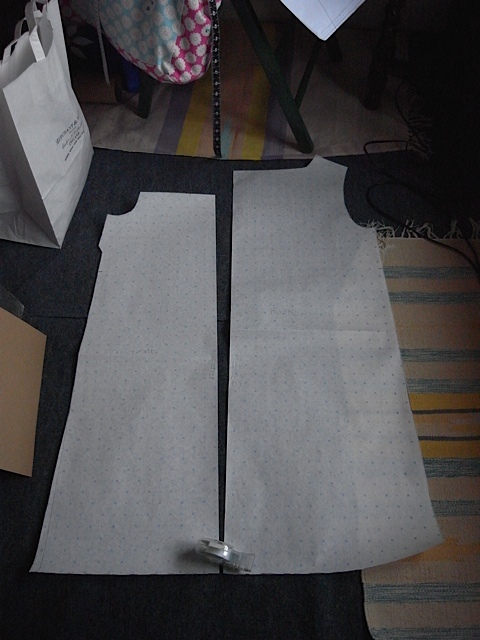 Have already cut out the fabric. 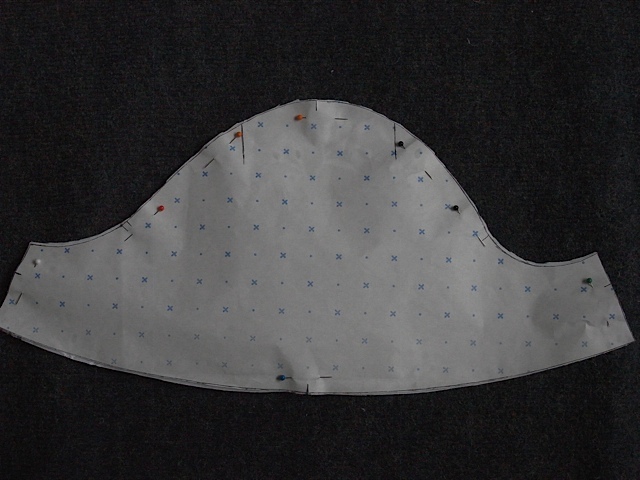 Here’s a pic of the fabric that was left, a meter of fabric, and then a pic with the pattern pieces laid out on it. I do love being able to turn a flat piece of fabric into something lovely.